I saw this recipe on page 124 of the October 2011 issue of Country Living magazine and have had it sitting on my kitchen counter ever since. One of my favorite things to do every fall is try new pumpkin recipes (as well as make old favorites) so this was a great opportunity. I also love finding ways to use pumpkin in savory ways as well as sweet. And so, last week I served this pasta to my family for dinner. Honestly, I wasn’t sure what they would think, especially my husband, but they all raved about it and were relieved I had made two pans full. I guess that means it’s a keeper! So here is the recipe, in case you don’t have the magazine. My family recommends that you try it! 1 (15 ounce) can pumpkin puree *make sure you don’t get pumpkin flavored for pumpkin pie! Cook pasta shells according to package directions. Drain and transfer to a baking sheet (or piece of aluminum foil) and drizzle with oil. Let cool. In a medium bowl, stir together ricotta, pumpkin, 3/4 cup Romano, egg, garlic, basil, sage, salt and pepper. Mix well. Spread spaghetti sauce in bottom of a 9×13 inch baking pan. 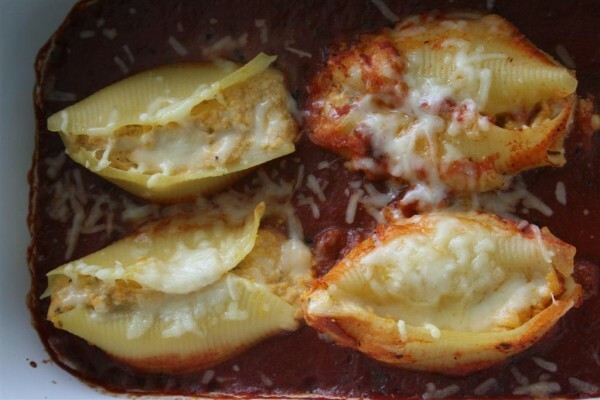 Fill each pasta shell with about three tablespoons pumpkin-ricotta mixture. Arrange shells in pan. Cover with foil and bake at 350 for 30 minutes. Remove foil, sprinkle with remaining cheese and bake 15 minutes more. Serve and enjoy! 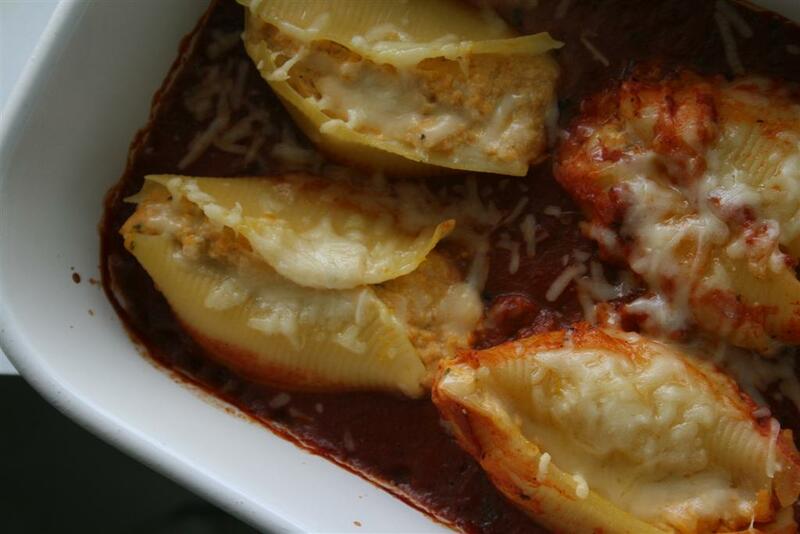 Note: I prepared this dish the day before, stuffed the shells and stored them between layers of plastic in an airtight container overnight. 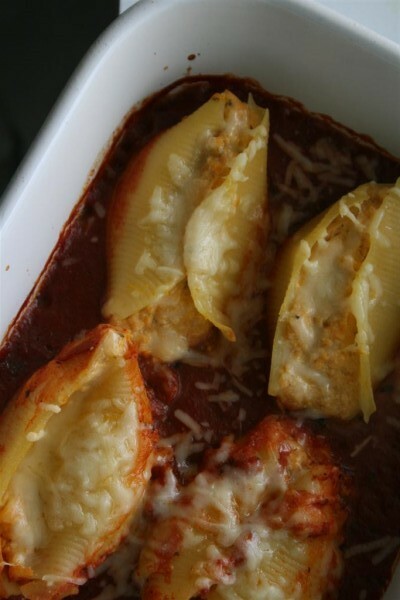 On the day I served them, my only prep was to pour the spaghetti sauce in the pan, arrange the pasta and bake! They tasted delicious, and the few we had left were delicious the next day as well. This was a delicious recipe. 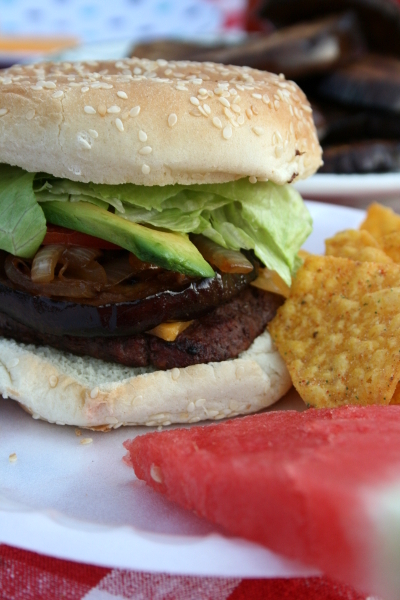 It’s meatless and relatively low in fat, considering that it’s mostly “cheesy”. According to the nutrition information provided by Country Living, one serving contains 321 calories, 22 grams protein, only 9 grams fat, 39 grams carbohydrates, 6 grams fiber, 977 milligrams sodium and 19 milligrams cholesterol. If I shared one of my all-time favorite recipes yesterday, I must say that today’s recipe is #1 on the chart. 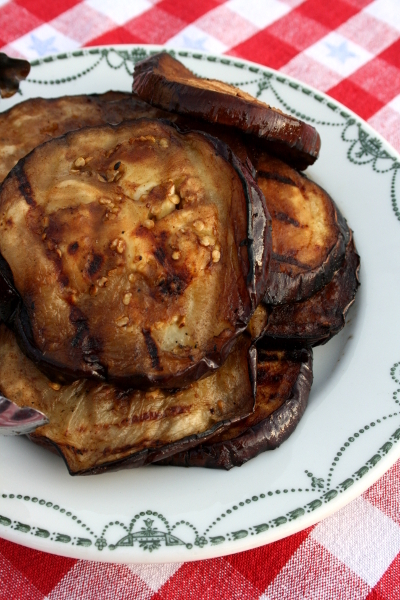 Simple and healthy yet delicious, this dish always receives rave reviews. 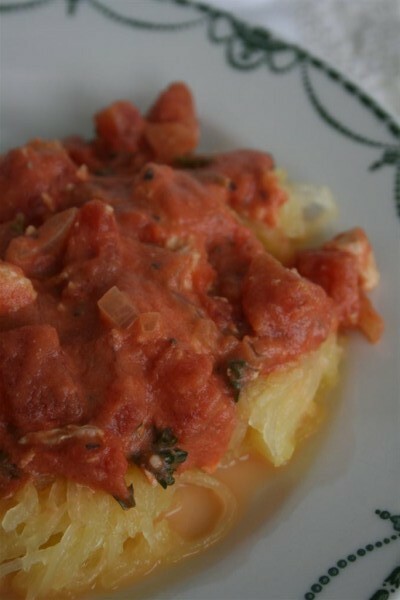 I must also credit this recipe with making huge spaghetti squash fans of my children. I love looking outside at our spaghetti squash in the garden, knowing how many times I can make this in coming months. 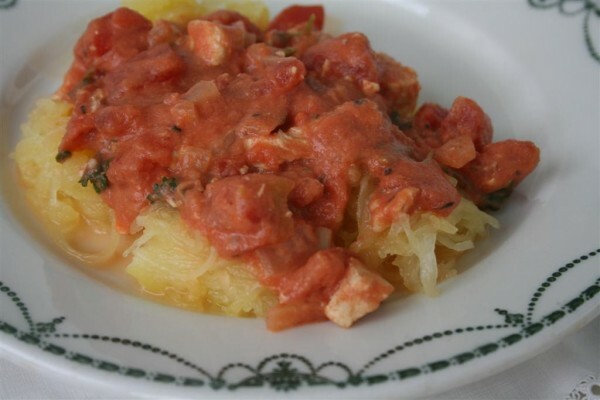 The dish consists of a creamy tomato sauce with chicken in it, served over spaghetti squash. Delicious. 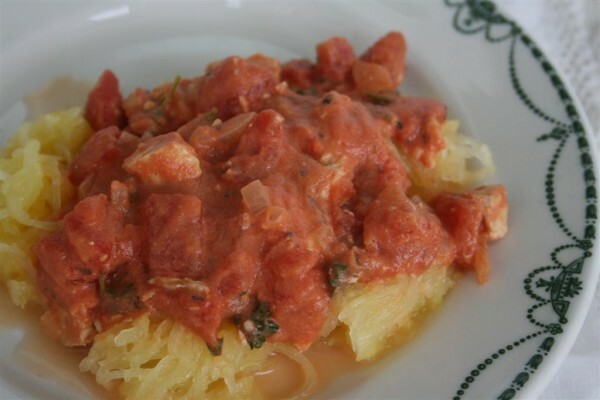 To cook the spaghetti squash, you have two options. First, you can poke a few holes in it and bake it, whole, in the oven (350 degrees). This is a great way to cook it but you must start early; depending on the size of your squash it will take over an hour to become tender and sometimes much longer than that. The second option is to halve the squash lengthwise. Remove seeds. Place cut side down on a microwave safe place. Again, depending on the size of your squash you may need to cook each half separately. Cook on high power for 5 minutes, check for tenderness. Cook for another 3-5 minutes. (Mine usually take 10 minutes for each half.) The squash is done when the meat scrapes out easily in long spaghetti-like strings. Scrape squash into serving dish, add 1 Tb. butter (if desired) and salt and pepper to taste. Toss and cover to keep warm. If you are baking the squash you must start it well before the rest of the dish; if using the microwave you can cook the squash while you cook the sauce. In a skillet, heat 1 Tb. oil. Add chicken and one clove minced garlic. Cook until chicken is done but do not dry out! Remove chicken from pan and set aside. Add the second tablespoon of oil to the skillet. Add onion and second clove of garlic. Cook until onion is softened. While onion is cooking, cut chicken into small pieces (I usually cut it in 1/2 inch cubes.) 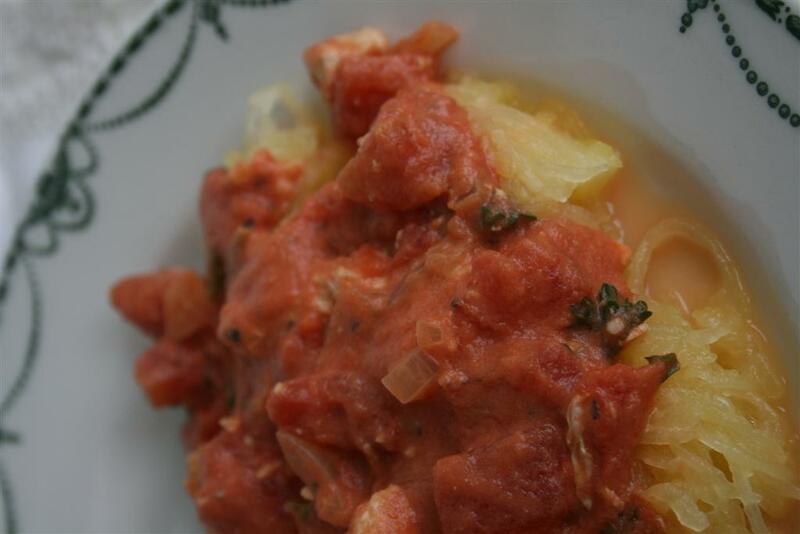 When onion is tender, add tomatoes, tomato sauce, sugar, oregano, basil, marjoram, salt and pepper. Simmer for 10 minutes. Add diced chicken. Stir in heavy whipping cream and heat through, about 2 minutes. Reserve 2 Tb. chopped parsley and add the rest to the tomato sauce. To serve, place spaghetti squash on plate, top with tomato sauce. Garnish with parsley. Enjoy!